In the Wade and Molly Blank papers are a number of boxes with great photographs. I love photographs of the disability rights movement. Obviously it is fun to look at how fashions and hair styles have changed over time but what really sticks out is the evolution of the wheelchair. I shake my head in wonder when I see old fashioned E&J folding wheelchairs and the very first power wheelchairs. Each and every time I see old photographs I am delighted by the technology incorporated into manual and power wheelchairs that empower people with a disability. But I digress here. I was surprised and disappointed to learn the original plaque dedicated on July 26, 1992 was replaced in 2005 to commemorate the 15th Anniversary of the ADA. I went by the plaque this morning and it is looking well worn. The plaque is dirty and slightly chipped in one corner. The surrounding area where the plaque is located is dominated by groups of homeless men. It is not a place to lounge around and I doubt the flower I placed on the plaque will last long. The Gang of 19 chose where to protest and surround a bus wisely. The intersection of Broadway and Colfax is a major hub. If you shut down this intersection as they did the streets branching off will become grid locked. I can readily imagine absolute bedlam in terms of traffic jams. The Gang of 19 were smart and veteran civil disobedience protesters. The point is that we cannot make America economically healthy without offending someone. Our combined inability to say no to a variety of well meaning but inefficient programs is an economic sickness that is striking at our very ability to survive. Can we afford to spend 8 billion dollars to put a lift on every bus in America when St. Louis, for instance, reports $600 per person per ride and Philadelphia $300 per person per ride? When the Congressional Budget Office estimates that by vans we can serve 3.5 times as many people for one-sixth the cost? It’s not a question of transportation. We should provide transportation for the handicapped. But just as handicapped citizens have a right to be transported, so we have a right, no, a duty, to make sure that transportation is provided in an efficient manner. History will judge us harshly—as trustees of America’s limited resources—unless we make both compassionate and efficient decisions. America is a Gulliver bound by a thousand threads of special interest Lilliputians. We cannot rise until we throw off those threads. America will not make its economic comeback without each of a wide variety of special interests to contribute. Adversity, thus—those whole last 10 or 15 years of adversity—should be our teacher, not our undertaker. We won’t win unless we offend everyone a little: Unless we tell the handicapped we sympathize and we will provide the most cost efficient transportation, but not the most expensive. I found Lamm's words shocking even in retrospect. Lamm went on to argue for the expansion of "special transportation" or para transit. This is the same man who in 1984 drew wide spread antagonism when he stated that the elderly, terminally ill, and disabled have "a duty to die and get out of the way so that our kids can build a reasonable life". He was no friend of Atlantis Community or people with a disability. He was an ableist bigot. I have no idea why the original plaque was replaced. However, I object to the deletion of the Gang 19 members being listed on the 2005 plaque. 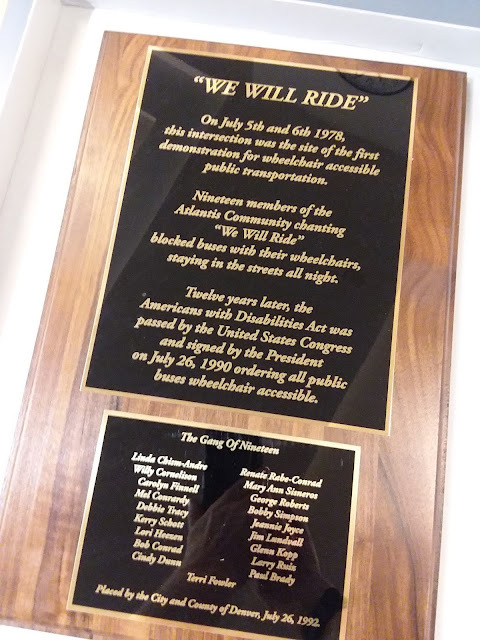 I object to the deletion of the line "We Will Ride" that was repeatedly chanted from July 1978 and through the early 1980s. I suspect Wade Blank would agree with me. He did not put his body on the line--the Gang of 19 did. They were the people threatened with arrest. To be blunt, the 2005 plaque is a historical white wash. The Gang of 19 is not mentioned. The Atlantis Community is not mentioned. The RTD is made to sound too good. They did indeed vote to become accessible but only did so because of highly effective legal, social, and civil disobedience actions. There is a large measure of irony here. The RTD that vigorously opposed placing wheelchair lifts on buses is now proud to be among the first major cities in the United States to be 100% accessible. 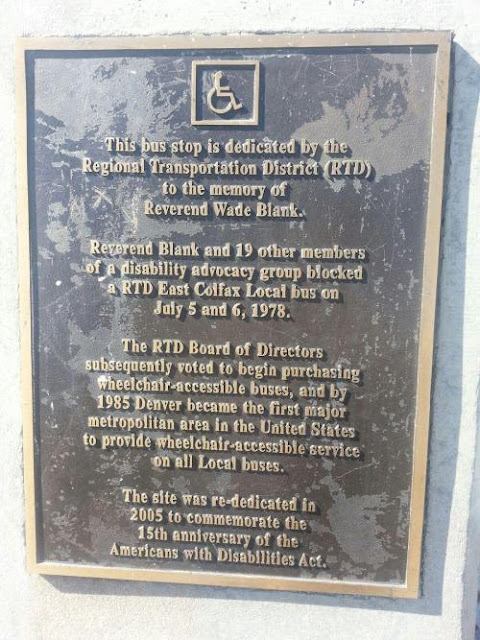 When I get on the bus I do not think of the RTD but rather an anonymous group of people who have been ignored by historians--and that includes those who work within disability studies and disability history. I for one remain forever grateful to the Gang of 19. Since moving to the Denver area, I have relied entirely on mass transit. Mass transit is always interesting and the people watching is amazing. On any given day I can be exposed to exceptionally well dressed people, the poorest of the poor, homeless parents with wide eyed children, the elderly, mentally ill and the crippled like me. I have found the light rail system (RTD) easy to navigate and the vast majority of train drivers to be excellent. The RTD bus drivers in contrast are a mixed bag. Most are unpleasant or unhappy to all. I get it. Being a bus driver is not an easy job. RTD buses are grimy and based one my experience homeless people use the bus on cold days (I presume to stay warm). Bus drivers also hate to tie down wheelchairs and are clear when I get on: "You don't need to be tied down, right?" Let me translate this statement. I am not getting out of my seat to tie down your wheelchair. Fine, I am well aware should the bus be in an accident I will become a human projectile. I find the bus versus drive train driver dichotomy interesting. Last night I had my first interaction with a train driver that was unpleasant. Unpleasant here is misleading. My short exchange at the end of my ride was an example of ableism and ignorance. When you get on an RTD light rail train the RTD driver lowers a ramp and asks where are you getting off. Deploying the ramp is easy and takes seconds. Train drivers are invariably polite and easy going. I have never had an RTD train driver be rude to me or complain about deploying the ramp. Train drivers as a group are a pleasure to deal with. Disability is never a factor. I am just another guy getting on and off the train. Riding the train is about as ordinary as ordinary can be. For this reason alone, riding the train is an absolute pleasure. Last night I had the following experience. I got on the train with a friend at Union Station. I told the driver my destination. As is the norm, the driver writes down my destination on a little board below the windshield. No driver has ever forgotten my stop. Last night was about as routine as humanly possible until I got off. At my stop the train driver got out of the front cab as the door opened and went to deploy the ramp. The driver looked at me and asked "Where is your care taker?" I replied as pleasantly as possible "My friend got off to pick up their car". Not impressed the driver replied "You should not be out by yourself. You need a caretaker". The driver proceeded to shake her head and glare at me in clear disapproval--like a nun who was putting the class clown in place with an icy stare. As I walked home I wondered how do people learn about disability. Whenever I am alone people will ask about my caretaker. This happens at airports, bus terminals, and car rental hubs on a regular basis. Often airline personnel appear shocked I am traveling by myself. When I am questioned about the location of my care taker my heart sinks. I never get angry when confronted with such an ignorant comment. I never reply with a cutting comment. Instead, this level of ignorance makes me sad and weary. Nearly 30 years after the ADA was enacted the level of ignorance associated with disability remains high. The ADA is rarely thought to be civil rights legislation. The ADA is routinely disparaged in the news and popular media. When some asks me "where is your care taker" I am repeatedly reminded disability rights is in its infancy. We as a nation have a very long way to go before people with a disability are treated as sentient human beings. The train driver's comment was a buzz kill. I went to a fun event at Union Station last night and had not one but two Old Fashioned drinks. On the train, my guard was down and after I was asked about where my care taker was I felt like a boxer that just got hit with a wicked and unexpected upper cut. Then again maybe the train driver has been reading the user manuals for my Apex wheelchair.